In 2010 a further visit to the cave on the 18th September resulted in the discovery of a cervid, interpreted by Dr George Nash as a reindeer. This was engraved on a vertical panel inside a discrete niche, located north-east of the main gallery. 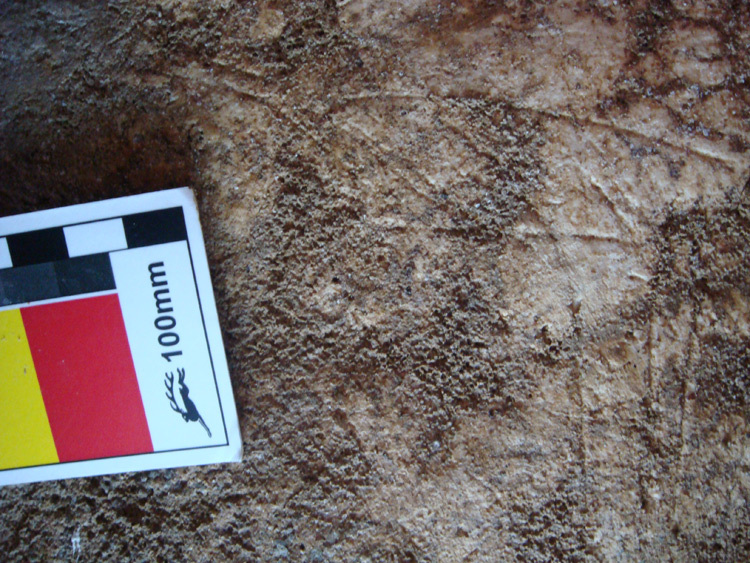 This near-hidden engraving is the first clear evidence of Pleistocene rock-art in Wales and only the second discovery of Pleistocene rock art in Britain. The stylized side-on view figure, measuring approximately 15 x 11cm, was carved using a sharp pointed tool, probably flint, and has a number of characteristics that resemble carved reindeer found elsewhere in north-western Europe. The niche was so tight that conventional cameras could not be used and therefore a series of overlapping images were made (Figure 6).The elongated torso has been infilled with irregular-spaced vertical and diagonal lines. 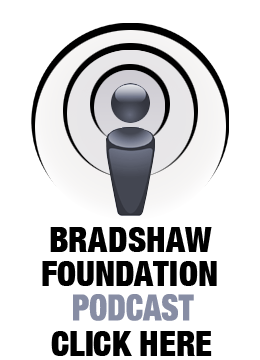 A single vertical line appears to extend outside the area, between the torso and the antler set, representing a possible spear. Several internal diagonal lines extend below the lower section of the torso, merging to form three of the four legs; the longest measuring 4.5cm. Incorporated into the left side of the torso and continuing beyond is the head (or muzzle) of the reindeer comprising a semi-circular snout, chin and mouth. 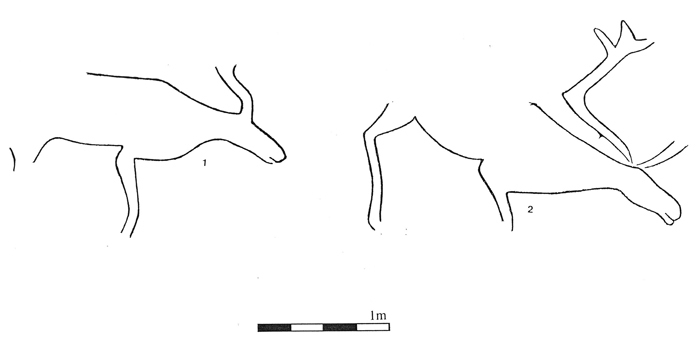 Above the muzzle is a thin rectangular block on which three lines extend to the right forming a stylised antler-set (Figure 7). 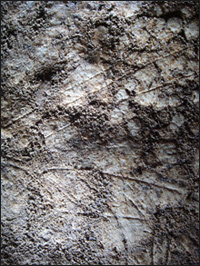 These various straight lines are cut into a weakly botryoidal calcite flowstone surface which has effectively sealed and covered any fractures in the limestone surface beneath. Any fractures developing subsequently on this flowstone would be influenced by its botryoidal form and hence show at least some degree of curvature. This is not the case and it is this contrast, between the straightness of the engraved lines and the curved nature of the relief on the flowstone that eliminates any possibility that the figure might be a chance configuration of natural fractures. Ey around 10,000 BP this tundra-loving beast appears to have migrated northwards, beyond the current shoreline of the British Isles seeking cooler climbs. 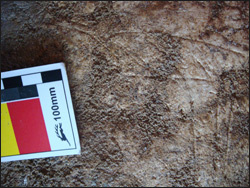 The stylistic characteristics, such as the shape of the muzzle, the antler set and the infilling of the torso are not uncommon with pecked reindeer engravings found along the fjords of central, southern and western Norway (Figure 8). Its location, hidden within a tight niche in the inner section of the cave is again not uncommon for Pleistocene rock art that is found in south-western Europe; its discreteness suggesting a sacred place and a personalized shrine. 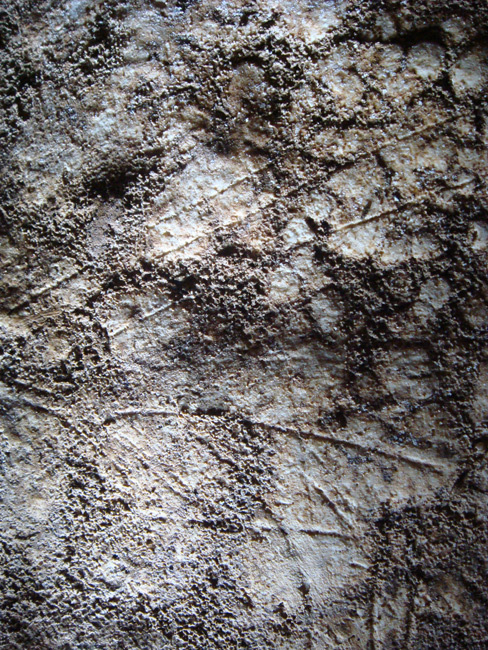 A good example of this is in Niaux Cave in the French Pyrenees; beyond the Salon Noir gallery and at the deepest point of the cave system, accessible to the Palaeolithic artist only by crawling on hands and knees - an indeterminate painting, perhaps a human figure or possibly the hind legs of a deer-like creature that seems to be disappearing into the very rock itself. In April 2011 members of the NERC-Open University Uranium-series Facility extracted samples from the surface on which the engraving was engraved for Uranium Series dating, along with a sample from a section of flowstone that covers part of the reindeer's muzzle (Figure 9). A single date has revealed that this engraving was executed prior to a flowstone deposit which dates to around 12,572 + 600 years BP. A further sample of the flowstone was taken left of the muzzle in July 2011. This sample may provide corroborative evidence of the age and confirm the absolute youngest age when the flowstone initially developed over the reindeer. The samples of the calcite underlying the engraving showed open system behaviour and an age could not be calculated. 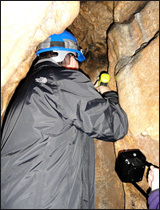 An assessment of the cave and its wealth of discoveries made so far are at an early stage of research. An accurate plan of the cave using 3D laser scanning technology is on-going; this technique may detect more rock art and will give the first acute plan of the cave. As part of next phase of the project, the reindeer will be recorded in greater detail and the hunt for more rock art will continue, but for now a tracing (figure 10) from the many images digitally taken will suffice. Following this phase a management plan will be produced in order to assess the archaeological potential and secure the caves long-term future. As part of the logistical support, Elizabeth Walker, Curator of Palaeolithic & Mesolithic Archaeology from the National Museum of Wales has been gathering data from previous excavations and it is hoped that this information will form the basis of a much wider project that will reveal more than just a moment in time when a hunter/fisher/gatherer scratched with his or her right hand an image of a reindeer! The Research Team includes Project leader and prehistoric rock art specialist Dr George Nash (University of Bristol), Dating team Dr Peter van Calsteren (Open University), Dr Louise Thomas (Open University) and Geologist and Cave Geomorphologist Dr Mike Simms (National Museums Northern Ireland).